Intelligent power networks and smart grid systems are demanding increasingly decentralized technologies that combine the storage and conversion of energy. Before this backdrop, in the scope of the EU’s CISTEM project (Construction of Improved HT-PEM MEAs and Stacks for Long Term Stable Modular CHP Units), a combined heat and power technology (CHP) has been developed on the basis of high temperature polymer electrolyte membrane fuel cells (HT-PEM FCs), which is able to provide an electrical output of up to 100 kWel. In addition to electricity generation, the heat produced by the HT-PEM fuel cell is used locally and/or for the purpose of district heating. The system is also configured flexibly in terms of its fuel use, so that it can be operated with both hydrogen and oxygen which can be provided through electrolysis, as well as with natural gas. The basic idea behind the project is a combined development of the fuel cells and a CHP system design. 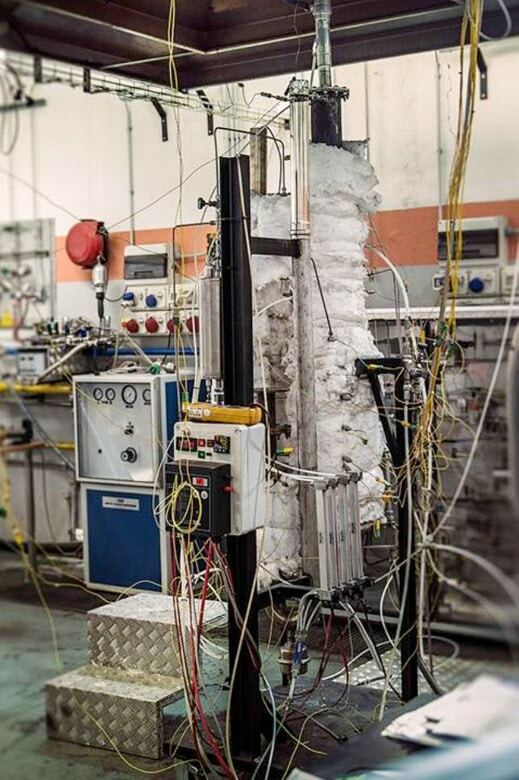 This combination offers the possibility of developing an optimized fuel cell technology for the specialist requirements of a CHP system as per the efficiency, costs and lifespan. Furthermore, the CHP system development is also able to incorporate the specialist advantages and disadvantages of this technology in order to ensure an optimized design of the fuel cell system. The CISTEM project aims to demonstrate the practicality of the HT-PEM technology in medium sized CHP systems (5 to 100 kWel). For this purpose, a CHP system with an output of 100 kWel was installed in a HiL environment (hardware in the loop) for demonstration purposes. A CHP system of this scale is especially suitable for generating electricity and heat at the local level (for example, at a housing development with several family homes). The system under construction right now is of a modular configuration and is comprised of fuel cells, each of which has two stacks with 4 kWel and one reformer. This strategy of interconnecting smaller modules offers the option of being able to adapt the size of the CHP system to a wide range of applications with scalable performance requirements, for different sizes of building or the energy supply requirements of specialist peak power generating systems, for instance. Within CISTEM at least two 4 kWel stacks are being used as hardware along with a reformer as a module. A further 14 modules are being used in tests as emulated modules in hardware in the loop (HiL). Combined with the upwards-scaling to a max. of 100 kWel, the HiL approach enables the simulation of different application and climate conditions which depict the differing load requirement profiles in northern, central and southern Europe. In this way, the control of the CHP system can be optimized in accordance with these load profiles. An increase in the electrical efficiency of the fuel cells is achieved with both the use of the oxygen from the electrolysis, which is not normally used, and through general improvement to the fuel cells which are used. In addition to this, the overall energy efficiency can also be increased in district heating systems through the additional use of the generated heat. The latter is possible due to the higher working temperatures of the HT-PEM fuel cells of between 140 and 180 °C. A key point of CISTEM is the optimization of the membrane electrodes units (MEA) in relation to the lifespan and the performance development. For this purpose, the PBI based membranes, the catalyst and the design of the MEAs have been developed further and modified. These individual cells boast a high lifespan and also stand out with degradation rates of less than -4 µV/h during long term tests under constant loads as well as with hydrogen and air as the operating gases. The especially low degradation rates mean that well over 20,000 operational hours can be expected. These new MEAs are used in small test fuel cell stacks as well as in the complete stacks which have been installed in the final modules. Materials for bipolar plates and gaskets from the project partner, Eisenhuth, have also been tested and developed further. With these beyond state-of-the-art MEAs, as well as ones which are state of the art, a wide range of experiments have been carried out in the project, such as long term tests and accelerated ageing tests for individual cells and small stacks of fuel cell test stands. The characterization of these cells has taken place on an electrochemical basis with the help of current/voltage characteristic curves, impendence spectroscopy and different voltammeter methods. These electrochemical processes are complimented with product water analyses in order to determine the platinum and/or phosphoric acid discharge. With the help of ante- and post-mortem imaging methods such as scanning electron microscopy and micro computer tomography, it is possible for mechanical and structural defects and/or the thermal relaxation behavior within an MEA to be highlighted. A further method in the area of degradation research is mathematical modeling. With the help of this approach, among others, the influence of flux field geometries or different operational strategies on the degradation of the individual cells and stacks can be calculated and forecast. For this purpose, the results of the laboratory tests are applied to fuel cell test stands. In an initial step, a two dimensional mathematical model of an HT-PEM fuel cell stack consisting of 100 individual cells was calculated and transferred into a three dimensional model. In the following step, the stationary model was adapted to a dynamic model. During the generation of the fuel cell stack model, the data of the components developed in the project (for example, bipolar plates including flow fields) were used in addition to the test results. With the help of the dynamic 3D models, it is also possible to determine parameters such as the level of materials use and the flow resistance, and to adapt them accordingly. During the planning and development of the CHP system, the lifespan, the costs of the individual components, and ensuring the highest possible electrical effectiveness of the overall system were all taken into account. Furthermore, during the configuration of the system it was also necessary for the legal and safety-related technical requirements to be considered. In addition to the development of the individual system components (the reformer and processor, for example), these were also tested, adapted and integrated in the overall system. In the scope of the CISTEM project, all of the components for two 4-kWel stacks and the module were constructed and tested. This includes both the design of two complete fuel cell stacks as well as a reformer (see image 1). To guarantee an appropriate configuration of the CHP system, a concept was developed which takes both the system factors into account (module size, system parameters, operating strategy) as well as the regional requirements in Europe (north European countries like Norway/Finland, central Europe with Germany, or southern Europe with Italy and Spain) On this basis, an optimized operational strategy was confirmed. The authors wish to thank the European Commission, which is supporting the CISTEM project as part of the Seventh Framework Programme (GA number: 325262, duration 01.06.2013 – 31.05.2016).